[London: 9 March 2018]: Embassy Gardens announces that construction of their world famous Sky Pool is well underway with the first pieces of the pool lifted into place. The pool is the first of its kind anywhere in the world and a short film has been created to document the first stage of assembly. The film follows the unique journey of the Sky Pool, from its production in the US to its arrival at London’s newest neighbourhood. Designed by Arup Associates and HAL Architects, with specialist engineering input from Eckersley O’Callaghan, the Sky Pool at Embassy Gardens is set to forge new ground as the world’s first transparent swimming pool which spans two residential buildings. The swimming experience is equally as pioneering, offering residents of Embassy Gardens a multi-sensory immersion within its crystal waters. The pool itself is 25m long, 5m wide and 3m high with a water depth of 1.2m. At 10 storeys high, the Sky Pool allows residents to swim from one building to the next while appreciating the dramatic backdrop of the new US Embassy building and the River Thames. Such is its proximity to the new Embassy that a heat reserve from the iconic building will be used as a heat source for the pool. 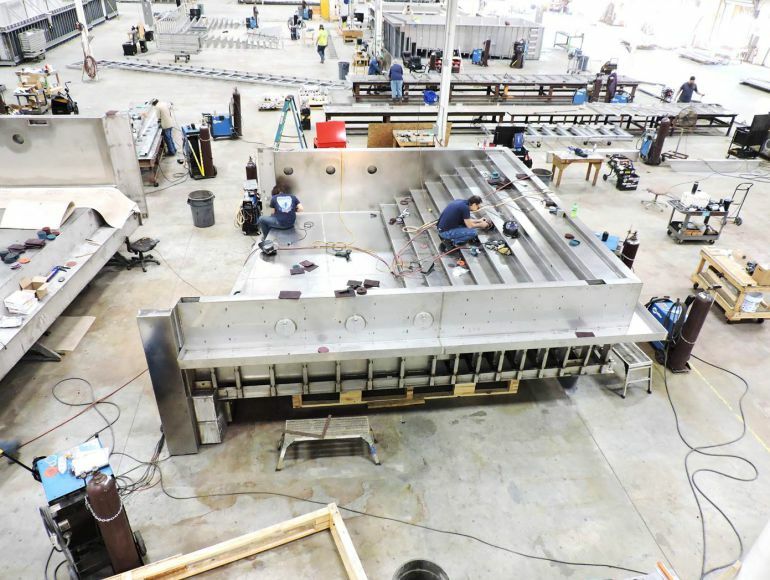 The Sky Pool’s stainless steel fabrication, produced by North Carolina’s Bradford Products, recently completed its extensive journey to the development in anticipation of the much larger shipment of transparent acrylic which will reach UK shores in the coming months. Produced in Colorado by Reynolds Polymer Technology Inc., the transparent acrylic section is the largest swimming pool component ever produced by the specialist factory, consisting of 18 individual panels – the first of which was cast in March 2017. Such is the size and scale of the project, the 58,000kg structure will be transported over 1,500km across the US mainland by way of a specialist highway patrol. The gravity-defying acrylic is due to be assembled with the steel at Embassy Gardens upon its arrival in London. Embassy Gardens is situated at the heart of the Nine Elms regeneration project and will provide nearly 2,000 new homes for Londoners. Developed by EcoWorld Ballymore, the scheme is more than just a place to live, offering residents access to stunning landscaped gardens, vibrant new bars and restaurants, al fresco spaces and 130,000 ft² of shopping space. The pinnacle of residential amenities is the private sky-deck which incorporates the Sky Pool, spa, summer bar and Orangery, where residents can relax and take in views of London’s iconic skyline. Speaking about the architectural inspiration behind the Sky Pool, Hal Currey, Founder of HAL Architects, commented: “The idea of incorporating an aqueduct into the buildings design was a vision from the outset, however it soon became clear that a fully transparent structure would elevate the project to being a world-first of international attention. It is incredible to see the pool in its physical form; it is certainly going to be an interesting swim”. Ben Blackwood, Ballymore’s Senior Design Manager, added: “It brings enormous pride to say that our collective dream of a seamlessly transparent structure is now becoming a reality. The complimentary set of skills from our dedicated team has allowed us to achieve this remarkable feat of engineering and design, from the inception of the Sky Pool to its installation”.